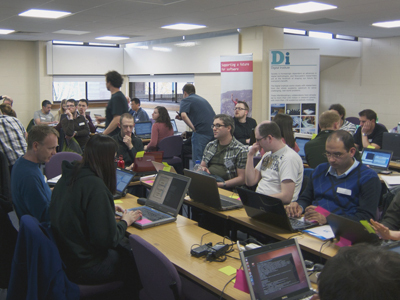 This week, Newcastle University played host to a Software Carpentry boot camp run by the Digital Institute at Newcastle University, SoundSoftware and The Software Sustainability Institute. This the first boot camp to be delivered entirely by UK tutors, independent of Greg Wilson's team in Canada. Neil, Steve and Mike joined the Digital Institute's Steve McGough and SoundSoftware's Chris Cannam for the daunting task of running the boot camp, having attended the first UK boot camp at UCL just 2 weeks ago! The attendees' comments were very positive and there was a number of valuable suggestions for future improvements - courses, like software, can benefit from iterative development. Software Carpentry aims to teach scientists how to quickly build the high-quality software they need, and so maximise the impact of their research. The format is a workshop, or boot camp, followed by 4-8 weeks of self-paced online instruction. Further boot camps are planned for later in the year at locations across the UK. Keep tuned to our blog or Twitter account and the Software Carpentry website for updates.